I am forever in search of the best brunch places in Edinburgh and boy did I hit the jackpot with this one. 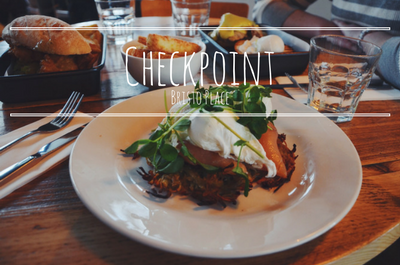 Checkpoint on Bristo Place is now officially one of my favourite brunch restaurants and let me tell you, it's hard to get a spot on that list! Now before I get into the food I do have to mention, because I'm always completely honest with you guys, that I wasn't particularly impressed with the service during my last visit to Checkpoint. I mean the food was A+, but if you're looking for a quick place to sit down and eat look elsewhere. We didn't wait long for the actual food to come, that came in a pretty standard amount of time, but we waited quite a while for our order to be taken and absolutely ages to get the bill. Quite a while after we'd finished I caught our waitresses attention and she came to clear the plates, I took this opportunity to ask for the bill. I'm not opposed to getting up and paying at the counter at the end of the meal, so I'm not sure if that's what we were meant to do but we certainly weren't told, the waitress just said that we could get the bill. We waited about half an hour and there was no sign of the bill coming, so my friend and I eventually got up and paid at the counter. But not to worry guys, the food was totally worth it. On my first visit to Checkpoint, I ordered the 'hash brown with eggs anyway' which I added salmon to. This was a really great dish, the ideal filling breakfast. Being the greedy guts that I am ordered a side of halloumi chips and oh my god these were sent from the cheese heavens to bless me. We're talking big chunks of halloumi deep fried in a light corn crust batter. If you're a halloumi fan... order these. My mum ordered one of the subs the 'fish supper' which was essentially fish and chips in a ciabatta (posh version of a fish finger sandwich... which is a thing more people than just me do... right?!). She really enjoyed it and it looked delicious, but the subs come with chunky chips and the whole thing is quite a big, filling meal so bring your appetites. I noticed they do a sub containing their corn crusted halloumi chips (like a fancy chip butty... again not just me right?!) which I'm so down to try next time. On my second visit I opted for one of the 'philfy rolls' that at just £5.50 are a bargain because they are so filling (probably because they are stuffed with fillings!). I opted for the 'poached egg, mozzarella, cured tomato, avocado and basil pesto' option which is the vegetarian and I added salmon to it because I'm apparently on a real salmon kick. This was so good, but again so filling. Your brioche bun sits open because the fillings are so generous, I had way more salmon and mozzarella than necessary and I was not about to complain about it. I also ordered a side of halloumi fries because I'm addicted. There are so many options on the menu that I'm definitely going to be back here for more. They also have a selection of cakes which I couldn't even look at I was so full. Their menu has a decent variety of veggie options which is always impressive. Overall I'm really impressed with the food at Checkpoint, it's exactly the food you want on the weekend. Check out their menu for yourself on their website!